Looking for a Used TT RS in your area? 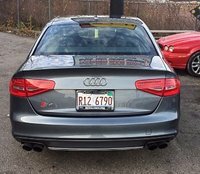 CarGurus has 25 nationwide TT RS listings starting at $29,900. The spicy TT RS continues as a lone trim into 2013 with just a 2-tone leather interior option added for its second year in the States, indicating a certain level of well-earned perfection in the present offering. The TTS gets the same in different colors—that's it—and nobody who owns either is complaining. If you can believe it, this stunning 4-seater coupe is expected to get even better for 2016 with a lighter platform and more of the TT's famed first-gen charms with an edgier take. Unfortunately all of that likely means Audi isn't planning any changes until a last-year-production big hurrah, if there is one, and this first-gen TT RS may not be the quickest TT on the road by 2016, but you can live with 4.3 seconds to 60 mph, right? You won't find many of these on the road, but that's in part due to why it took so long to get the TT RS States-side in the first place: demand. The 2.5-liter inline 5-cylinder brings 360 hp and 343 lb-ft of turbocharged torque to all 4 wheels for deceptively quick acceleration, and fetching 18 mpg city/25 highway for so much performance. No, it's not a hybrid, but you will find technology like "Magnetic Ride Control" absorbing shocks in addition to its specialized all-wheel independent suspension, and the speed-activated rear spoiler is sure to impress while dramatically improving high-speed stability. Rare as it is to see a TT RS, it is also hard to tell a TT RS from any other adaptive-suspension-equipped TT unless you're a stickler for wheels or manage to catch a glimpse at the badging on the seats. Nevertheless, those of a more classic taste will be able to appreciate its more subtle differences, like black-and-chrome two-tone schemes instead of the brighter TTS interior colors. Of course, also exclusive to the TT RS is an obligatory 6-speed manual transmission in typical Audi short-throw form. That about settles it for most people, but you might want to at least come back to this review before you buy, since I can't blame you for being antsy. Like that of every other TT coupe, the trunk offers a class-average 13 cubic feet for cargo until you fold down the 50/50-split rear seats flat to offer the full 24 cubes, and since even kids might complain if you try to use those 2 rear seats for people, that extra cargo space is the extent of its practicality. The TT RS is least suited to long rides, being the purest-sport TT—its particularly satisfying exhaust note, generous road-song allotment and sporting suspension tend to grate on the nerves after a couple of hours. The ride can be softened a bit with selectable drive modes, but the TT RS still drives with a marked sporting thump over imperfect roads. The lone trim is a 2+2 coupe outfitted with features like 19-inch wheels, performance summer tires, xenon headlights, automatic wipers, heated mirrors, an auto-dimming rear-view, 8-way powered front sport seats and a 9-speaker sound system with satellite radio and auxiliary connectivity with a CD player. Options include the Tech, Sport Exhaust and Sport Exhaust Titanium packages alongside several standalone options for all your gadget, carbon fiber and sporting desires, and if the rear wing spoils it for you then it can be omitted for no extra charge. 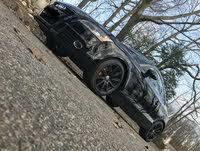 What's your take on the 2013 Audi TT RS? 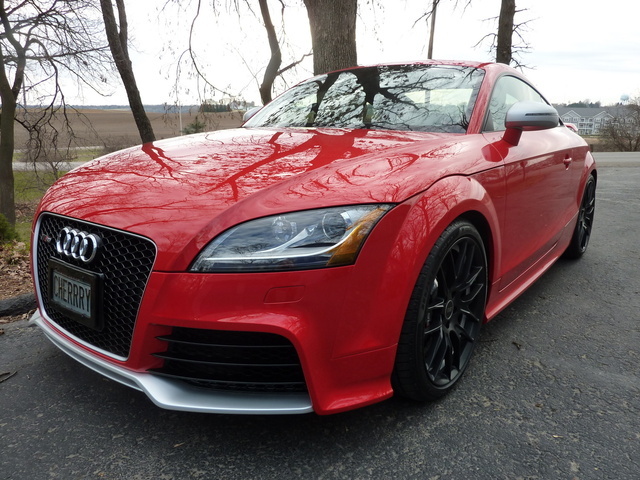 Have you driven a 2013 Audi TT RS?